(MENAFN - UkrinForm) Canada and the EU have the same vision of security challenges and are ready to continue to work closely together to address the most important foreign policy issues, including the situation in Ukraine, according to a joint declaration of the Joint Ministerial Committee (JMC) of the Canada-EU Strategic Partnership Agreement. 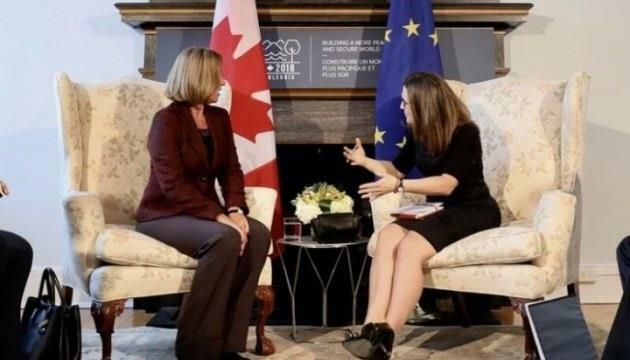 The meeting, which took place in Montreal on Tuesday, was co-chaired by Canada's Minister of Foreign Affairs Chrystia Freeland and EU High Representative for Foreign Affairs and Security Policy and Vice-President of the European Commission Federica Mogherini. "The JMC acknowledged the importance of the transatlantic relationship for peace, security and prosperity on both sides of the Atlantic. The partnership, based on mutual respect and shared values and interests, remains indispensable-especially at a time of major geopolitical challenges that no individual country can resolve on its own. The JMC reiterated the shared commitment to cooperate closely on all pressing international humanitarian crises and peace and security challenges, including in Russia and Ukraine, Syria, Iraq, Iran, DPRK and Mali, Venezuela and Myanmar/Burma," reads the document . The sides emphasized that cooperation in security and defense constitutes an integral pillar of the Canada-EU strategic partnership, as confirmed by the dedicated annual Security and Defense Dialogue, held most recently on October 23, 2018, in Ottawa. "The EU appreciates Canada's continued support of EU missions and operations and welcomes the participation of Canadian police in EU missions in Ukraine (EUAM Ukraine) and the West Bank (EUPOLCOPPS)," the declaration reads.